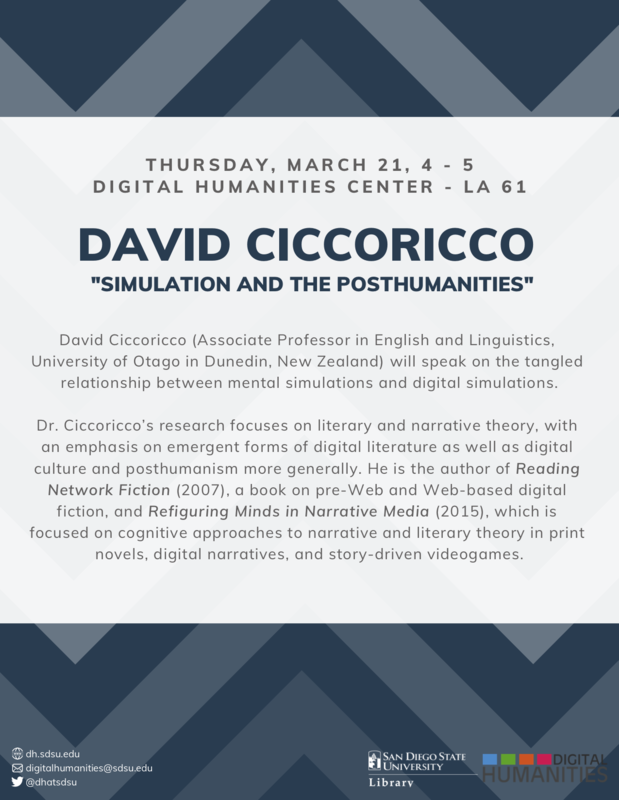 David Ciccoricco will speak on his paper that historicizes the tangled relationship between two kinds of simulation, the mental simulations that happen in human minds and the digital simulations that happen on computer screens, and speculates about that relationship’s transdisciplinary future. It also suggests some ways in which aesthetic appropriations of simulation – as seen in creative media and digital literature – can play a significant and revealing role in mediating between the cognitive and the computational. Ciccoricco begins by positing an alternative history for the concept of simulation, which – unlike many critical accounts in the humanities – does not begin and end with Jean Baudrillard. Rather, the narrative starts with Warren McCulloch, who serves as a kind of patron saint of transdisciplinarity. Despite famously formalizing corresponding mechanisms in “man” and “robot,” he remained (instructively) ambivalent about the gap between disembodied logic and actual embodied experience – and, more broadly, the gap the between the model and the system being modelled. Ciccoricco surveys a diverse and diffuse range of applications of simulation that have gained purchase in humanities scholarship, from literary studies to game studies, including simulation as empathy (Salter), “realisticness” (Galloway), immersion (Ryan), imagination (Hogan), and even a master trope for all fiction and literary experience (Oatley). These conceptions evidence an acute awareness if not a conspicuous cross-breeding of mental and computer simulation. For decades, mental simulation has anchored one crucial component of the broader research program in contemporary cognitive science, namely Theory of Mind. More recently, however, the concept has taken on a more central role in terms of understanding cognition, beyond that of a mode to intuit other minds and their mental states. Moves to ground cognition in sensory motor systems (Barsalou 1999) not only mark a fundamental departure from computational theories of mind underpinned by classic AI and the idea of mental representation, but also a divergence in the way simulation is appropriated culturally. That is, our understanding and use of cognate terms in that semantic field evidence a rhetorical convergence between human and machine that seemingly underscores and exacerbates our posthumanist condition; for example, social networks are now digital by default and neural networks primarily connote machine learning. Simulation, however, appears to be bucking that trend, with far-reaching implications for what we might call the essence of both humans and the humanities. David Ciccoricco is Associate Professor in English and Linguistics at the University of Otago in Dunedin, New Zealand. His research is focused on literary and narrative theory with an emphasis on emergent forms of digital literature, as well as digital culture and posthumanism more generally. He is the author of Reading Network Fiction (2007), a book on pre-Web and Web-based digital fiction, and Refiguring Minds in Narrative Media (2015), which is focused on cognitive approaches to narrative and literary theory in print novels, digital narratives, and story-driven videogames. This event is part of the Lecture Series in the Digital Humanities Center. The Lecture Series Track features a variety of scholars, artists, and practitioners speaking about working at the cutting edge of the Digital Humanities. For other tracks and events, visit our Events and Activities page.